This collaboration between performance artist Susan Hefuna and NYUAD’s Attitude Dance Society offers a performance interpretation of Hefuna’s drawings and the urban movement that unfold every day at crossroads in Abu Dhabi. This is part of the programme of free public events and workshops designed to allow the public to explore the themes of The Creative Act: Performance, Process, Presence, the second exhibition of artworks from the Guggenheim Abu Dhabi collection, now running at Manarat until 29 July. Featuring works by more than 25 artists from different nationalities and generations, the exhibition explores the related themes of performance, process, and presence through a variety of mediums. After the performance, guests are invited to an extended evening of music, art, and activities that relate to the artwork featured in The Creative Act. AB Gallery is delighted to present the artist Nastaran Safaei (*1984, Tehran, Iran) in her first solo exhibition in Switzerland. Safaei one of the young emerging talents of the Iranian contemporary art, has gain its international success through exceptional sculptures and installations. In her work, the artist mainly focuses on social issues with a touch of personal experiences and ironic view of these situations. In the exhibition "Inner Selfie", whose title can be loosely translated as "Inner Self Image", the artist shows various aspects of her personal "being" as a woman as well as her emotions which she is not allowed to show or even live in her country. In her art, Safaei expresses the schizophrenia, which she is at the mercy everyday: a flying chest, a bust of her head with octopus legs, her fingers and lips served as "finger food" or the installation "Simurgh", in which 30 decorated chicken were presented or served on golden plates. The artist describes the origin of her artworks as follows: "Throughout and in the different stages of my life I have found aspects of my character that can in no way be fitted within a simple template or definition; various emotions, very conflicting at times, that I have been carrying through the ups and downs of my journey; and all the love/hate that has come my way, nested in or departed from me. My portrayal of such emotions and experiences is perceived as a dress that others use to judge me by. While in it, I have all these complex concepts and enigmas that even I cannot always define. I have attempted to include a quite personal part of my essence in my works while depicting my power over what I present others with and how I can become transparent in the face of judgments and comments. The embodiment of this, along with a contradicting sense of purity and evil – that can coexist in my soul – is displayed in my works." Nastaran Safaei studied for an Associate Degree in Graphic Design from Sooreh University (2004) and she received a diploma in Graphic Design from Naghshe Kowsar Art School (2001). Afterwards she focussed mainly on the media sculpture and installation. Today she is a member of "The Association of Iranian Sculptures as well as co-founder of the sculpture circle "Maakous". Since 2002 her works has been exhibited in numerous solo - and group exhibition in Iran and abroad. 2013 her works has been shown in an extended solo exhibition at Etemad Gallery, Tehran and at the same time in a group exhibition entitled "Excuses": a group effort" in the Villa Kuriosum in Berlin, Germany. From early October to late November 2014, the artist will participate at the Artist in Residence program of the ORYX Foundation Lucerne / Switzerland and create new artworks which will be presented during the exhibition. We would like to invite you to the Open Sunday, November 23, 2014, from 11am to 4pm. The exhibition runs from November 23 to December 20, 2014 in the AB Gallery Lucerne. The Mine presents the exhibition “The Impact of Tangency”, featuring the new body of work by Iranian artists Nastaran Safaei and Farnaz Rabieijah. Best known for their large installations and sculptures dealing with social matters, in this exhibition the two artists develops a series of experimental approaches to print, revealing a sense of feminized interiority in connection with the surrounding world. Nastaran Safei, Body Impressions series, 2017. Courtesy of the artist and The Mine. Art manifests itself in many ways at mamnoon, in the food, in the music and in the art. 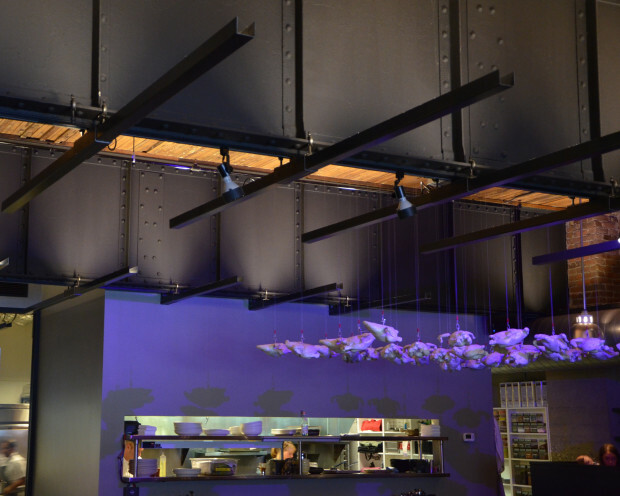 Our most prominent piece, an installation of thirty fiberglass chickens, hangs over the dining room. \"Simorgh\" is the work of Persian sculptor Nastaran Safaei. Maintaining an air of playfulness and levity, the artist has instilled a double meaning in \"Simorgh.\" It derives its influence primarily from the character of the same name in Farid al-Din Attar\'s twelfth-century poem \"The Conference of the Birds,\" which follows a flock as they travel through the many valleys of life as they search for illustrious King of the Birds. Safaei plays on the name further: Separately, the syllables of \"Simorgh\" translate to thirty (\'si\') birds (\'morgh\'). با ارائه سه مجموعه از آثار اخیر خود، نسترن صفائی، ذهن کاوشگر و تلاش مداوم خود در طی مسیر هنری اش را به نمایش می گذارد. در مجموعه «بنای یادبود آنچه از یاد رفته‌است»، با ساخت تصویر تلفظ کلمات : آرامش، سکوت، آن، شهود، هنرمند اهمیت مفهوم این کلمات را به خود و دیگران یادآوری می‌کند. مفاهیمی که نباید در تب و تاب روزانه از خاطر بروند. این بت واره‌ها با سیمان و خاک مقدس کشور پوشیده می شوند تا حضوری ازلی بیابند و منشا الهام برای دیگران نیز باشند. در مجموعه «بالاتر و فراتر»، مرکب اثر بدن را به پارچه منتقل می کند. ثبت لحظه‌های آنی و حسی و حتی ناخودآگاه با نازک ترین واسطه ؛ پوست. اثر بافت بدن، کم رنگ و پررنگ شدن، سکون و حرکت و تکرار این چرخه ، قطع و وصل شدنِ ارتباط با خود و جهان بیرون را نمایان می کند. صمیمت و کیفیت بازیگوشانه ی که در این سه مجموعه به چشم می خورند، نشانگر ثبات قدم و بلوغ و نتیجه تلاش های یک دهه حضور هنرمندی پرتلاش و پیش رو ، در صحنه هنر ایران است. Presenting three sets of recent works, Nastaran Safaei reveals her probing mind and restless quest in her artistic endeavor. In the series, Monument To That Which is Forgotten, she echoes words that are important to her; tranquility, silence, instant, and intuition. She builds monuments to these words to remind herself of importance of what is essential and ought not be lost in the hustle and bustle of everyday life. She coats these Totem like sculptures with cement and sacred soil of her land, wishing them to become eternal and to inspire others as well. In her second series Above And Beyond, ink transfers body impressions on to canvas fabric. Emotions and unconsciousness are registered through the thinnest of mediums; the Skin. The impact of texture of body, at first pallid and then defined, tranquility and movement and the repetition of the cycle, reveals the connection and disconnection of self with the outside world. 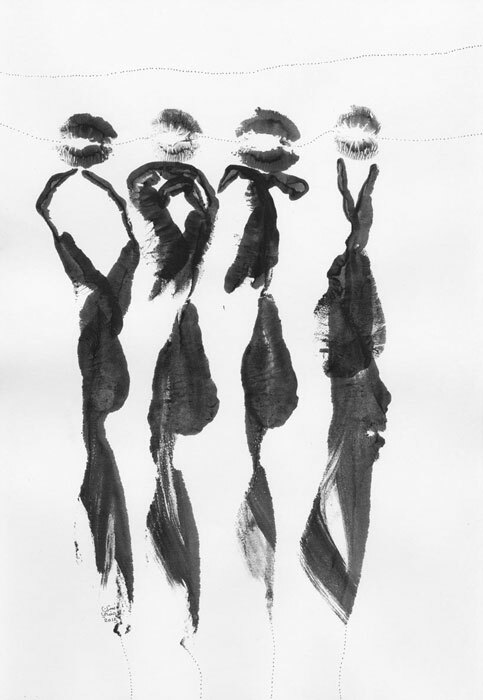 In the series Body Impressions, the dots and dotted lines, register and connect the path of evolution of artist. The intimacy and playfulness in these three sets of works are indicators of her perseverance and maturity and are the fruit of her labors in the last one decade. Nastaran Safaei and Farnaz Rabieijah are best known for their often-monumental installations that translate contemporary gendered and societal concerns. Here, they translate themselves. Finding themselves at a new juncture in their lives, as artists and as women both, they trade in the tactile materiality of sculpture for two experimental approaches to print. What emerges, unfurling luxuriously onto paper like a long-dormant shoot, is a feminised interiority and a newfound sense of connection, both to nature and to the outside world. In Body Impressions, Safaei uses her own body to make marks on textiles. Yet the figure is not depicted but only intimated here, with smears and swooshes that might be a shoulder or perhaps a knee; it is unclear. Spidery skeins of dots connect body parts to each other and trail off the page with a tentativeness that directly contrasts with the assertive intensity of these body prints. In Rabieijah’s Spinning Plate, meanwhile, plants are pressed into paper to leave beautiful deboss-like indentations. Unlike pressed and preserved plants, the botanic matter is then removed and discarded, leaving only the void behind, like a trail of perfume after someone has forever walked away. Art Radar delves into the practices of 6 emerging talents in the Iranian art firmament. As AB Gallery holds a group exhibition of young Iranian artists, Art Radar studies the works of Sara Abbasian, Ali Esmaeillou, Sahand Hesamiyan, Azadeh Razaghdoost, Nastaran Safaei and Samira Hodaei. Nastaran Safaei (b. 1984, Tehran) trained in Graphic Design, but later started to focus mainly on sculpture and installation. Her oeuvre engages with the inner, personal sphere as a woman – her personality, her emotions, self-reflection – and, by extension, with the social issues attached to femininity in general. Her work often involves bronze casts of her own body parts, as well as elements of feminine identity, such as mirrors, dresses or hearts. I have attempted to include a quite personal part of my essence in my works while depicting my power over what I present others with and how I can become transparent in the face of judgments and comments. The embodiment of this, along with a contradicting sense of purity and evil – that can coexist in my soul – is displayed in my works. 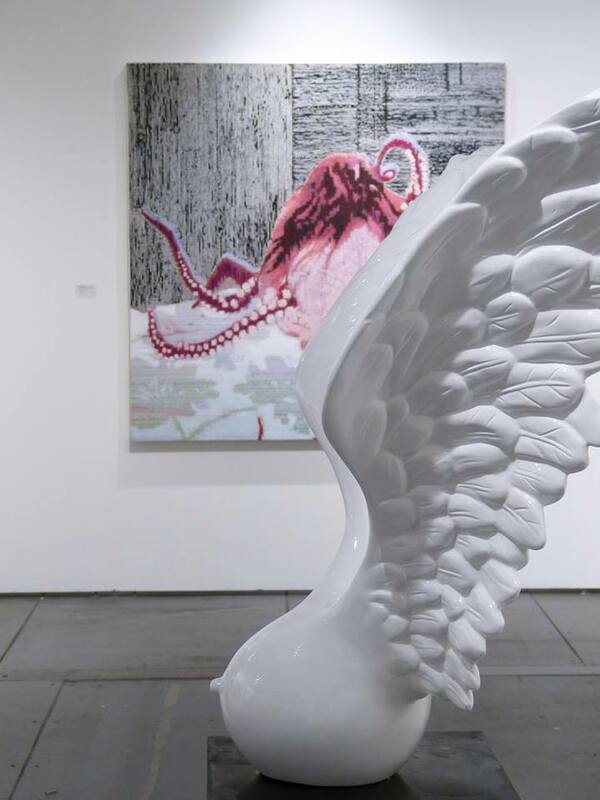 Flying (2014) is a symbol of the balance and harmony between anima (the breast) and animus (the wings), as Safaei writes on her website. The artist references Jungian philosophical thought, where anima is the symbol of womanhood and animus of manhood, co-existing in each individual regardless of gender. Through this sculpture, Safaei depicts what she calls “the fruit of evolution” – and the power as a result of perfection. Her work Dress (2014) addresses the complexities of humankind, and her attitude about external appearance and true, inner character. The sculpture is of a colourful dress made of found and recycled everyday objects and papier machê attached to an iron frame. Where the womb is located, there is a dark, cavernous opening, with small bronze hanging sculptures. People usually see my appearance and judge me on the basis of how I look. But I have secrets inside me… formless secrets that even I cannot define completely; secrets and complexities that are quite special and valuable. DIE AB GALLERY IN LUZERN EMMENBRÜCKE VERTRITT ZEITGENÖSSISCHE POSITIONEN AUS DEM ARABISCHEN RAUM UND LÄDT KUNSTSCHAFFENDE EIN, WÄHREND ZWEI MONATEN IN DER SCHWEIZ ZU LEBEN UND ZU ARBEITEN. WIR SPRACHEN MIT DER BILDHAUERIN NASTARAN SAFAEI ÜBER IHR LEBEN ALS KÜNSTLERIN IM IRAN, ÜBER IHREN EINDRUCK DER SCHWEIZ UND ENGEL. Wer am kleinen Bahnhof Emmenbrücke Gersag aussteigt, würde hier nicht eine Galerie für Kunst aus dem arabischen Raum mit bemerkenswertem Konzept erwarten. Genau diese gibt es aber, ein paar Hundert Meter vom Bahnhof entfernt befindet sich die AB («across borders») Gallery. Der Standort Emmenbrücke hat sich als geeignet erwiesen: Er ist zentral gelegen und aus der ganzen Schweiz sowohl mit den öffentlichen Verkehrsmitteln als auch mit dem Auto gut erreichbar. Parkplätze sind genügend vorhanden. Wegen der täglichen Staus zu Stosszeiten gibt es hier aber nicht die klassische Vernissage an einem Abend unter der Woche, sondern «open sundays». Heidi und Franz Leupi laden regelmässig Kunstschaffende ein, am Programm «Artist in Residence» teilzunehmen. Während zwei Monaten können diese in einer Wohnung gleich neben der Galerie wohnen, Atelier und Materialien stehen ihnen zur Verfügung. In der grossräumigen, zweistöckigen Galerie ist auch das Lager untergebracht, und die Leupis wohnen direkt über den Ausstellungsräumlichkeiten. Und noch etwas ist ungewöhnlich: In der Galerie gibt es einen gemütlichen, offenen Essraum mit orientalischen Leuchten und bunten Kissen. Hier werden Kunden empfangen, man speist und trinkt inmitten von Kunst. Wir trafen die Bildhauerin Nastaran Safaei, kurz bevor sie nach ihrem zweimonatigen Aufenthalt nach Teheran zurückkehrte. Die Dreissigjährige zeigt in der Ausstellung «Inner Selfie» Werke, die während ihrer Zeit in der Schweiz entstanden sind sowie einige ältere Arbeiten. Parallel werden die Gemälde der Iranerin Elnaz Farajollahi gezeigt, die ebenfalls am Programm «Artist in Residence» teilnahm. Die Doppelausstellung dauert bis 24. Januar. SI Style: Nastaran Safaei, was hat Ihnen in der Schweiz am besten gefallen? Nastaran Safei: Hier ist es so ruhig und friedlich. Das war sehr wichtig für mich und meine Arbeit. Es gibt viel positive Energie, und du fühlst dich sicher. Natürlich ist auch die Natur sehr schön. Welcher war Ihr schönster Moment? Ich glaube, beim Arbeiten in den Studios war ich am glücklichsten. Aber ich nahm auch die Gelegenheit war, die Schweiz zu erkunden, ich besuchte Genf, Zürich, Bern und Basel und mochte sie alle. Wie hat die Schweiz Ihre Arbeit beeinflusst? In Luzern habe ich überall Engel gesehen. Das Motiv habe ich in einer Arbeit aufgenommen und kombiniert mit einem Glücksstein aus dem Iran, der in unserer Tradition für Schutz steht. Ein anderes Mal habe ich aus einem Stück Leinwand ein Kleid gefertigt und es mit meinen blossen Händen bedruckt. 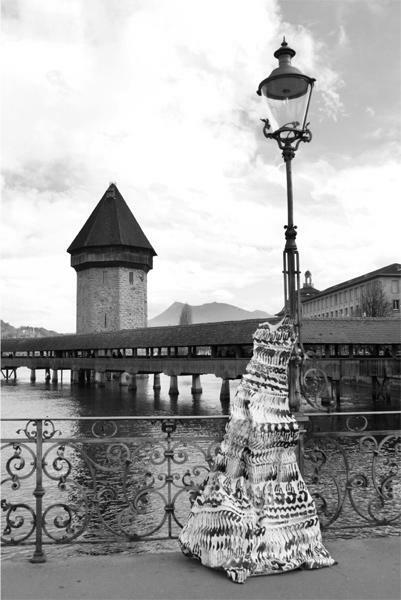 Danach fotografierte ich das Kleid an all den Orten in Luzern, wo ich mich am liebsten oder am häufigsten aufhielt. Es ist eine Dokumentation meiner Zeit hier. Was denken Sie, wenn Sie junge Frau von hier sehen? Ist das Leben sehr anders als im Iran? Natürlich ist das Leben anders. Aber als Künstlerin fühle ich mich sehr gut in meinem Land. Es waren wunderbare zwei Monate hier, Heidi und Franz Leupi sind so liebenswürdig. Trotzdem bekam ich nach etwa einem Monat Heimweh. Fühlen Sie sich im Iran frei als Künstlerin? Ja, ich fühle mich absolut frei. Ich habe meine eigene Wohnung, meine Arbeit, meine Freunde. Ich kann von meiner Kunst leben, bin nicht reich, aber es reicht. Iran hat seine Probleme, wie jedes andere Land auch. Können Sie Ihr Werk «Flying», eine nackte Brust mit Flügeln, zeigen? Nein, öffentlich kann ich diese Arbeit nicht zeigen. Aber an privaten Veranstaltungen geht es. Ich mache alles, was ich möchte. Begeben Sie sich nicht in Gefahr, wenn Sie solche Kunst machen? Nein, das ist kein Problem. Teheran ist reich an Kunst, es hat eine hohe Dichte an Galerien, und es leben sehr viele Künstler dort. Jedes Wochenende gibt es irgendeine Kunstveranstaltung. Ja, ich bin oft auf Facebook, manchmal auf Instagram. Das ist für mich sehr wichtig, um meine Ausstellungen zu promoten. Da ich die meisten Ausstellungen in Iran mache, sind es meistens iranische Sammler. Aber ich habe auch ein paar Käufer in Europa, da ich zum Beispiel auch schon in Berlin ausgestellt hatte. Wenn ich zurück bin, werde ich sofort loslegen mit neuen Projekten. Ich spüre, dass sich in mir etwas verändert hat. Ich konnte andere Materialien testen, einfach drauflosarbeiten. Ich kehre voller Energie zurück. The Iranian group exhibition “Made in Iran II” at the AB Gallery Lucerne starts the season with brand new art pieces from Tehran. In addition to latest creations by already well-established names of the contemporary art market, works by AB Gallery’s recent discoveries are going to be exhibited for the first time in Switzerland. Linked to the previous exhibition of the series “Made in Iran”, this show enables the visitor to deepen his insight into the current happenings of the Iranian art market and discover a fascinating culture. Nastaran Safaei was born in Tehran, Iran, in 1984. She studied Graphic Design at the Sooreh University (2004) and the Naghshe Kawsar Art School (2001) before she specialized in sculpture and installation. Body parts and personal (female) feelings are reoccurring elements in her oeuvre. Her works always convey emotions and raise questions about the (inner) self of an individual. Since 2002 Nastaran Safaei exhibits extensively, for example in Switzerland, Great Britain and Germany. Today she is a member of the Iranian sculptors’ association. The lion as a topic is a fascinating issue to the young sculptor Hamed Rashtian (*1984, Tehran) in many ways. On the one hand the old tradition of the lion as a tombstone or stone sculpture in Persian culture captures him for many years now. Among others, his former tutor Parviz Tanavoli, one of the most influential, contemporary sculptors in Iran, inspired him to work on this theme. On the other hand the lion appears as a hugely important symbol for the artist’s own personality. Consequently very own experiences are reflected in his art pieces, too. 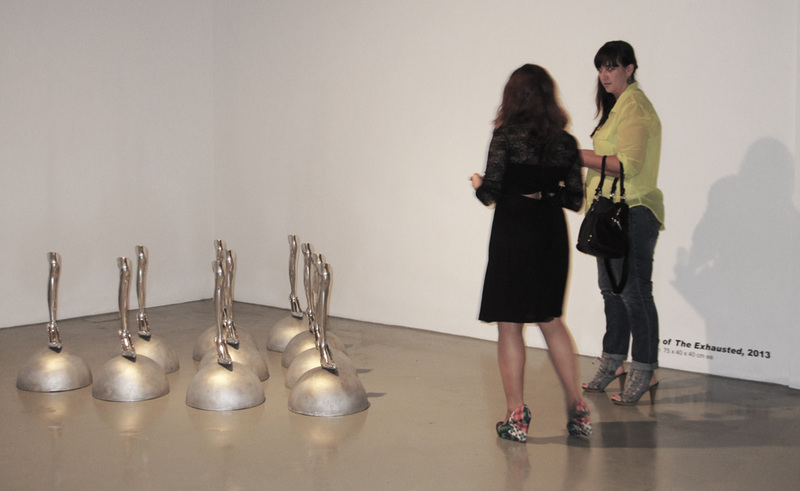 For over ten years now, Hamed Rashtian creates sculptures made of bronze or fiberglass. Since 2006 he exhibits them internationally, for example in the UK, Germany or the UAE. Born in 1967 in Tehran, Samira Alikhanzadeh started painting in 1987 under the supervision of the Iranian Master Aydin Aghdashloo. Two years later, she attended Tehran’s Azad University where she continued to complete her MA in painting. Frequently, mirrors and old photographs can be found in the oeuvre of the artist. By using old portraits from the 30s, 40s and 50s she intends to transport a melancholic truth of her culture’s past and also the humor that comes along with it. Especially while looking at old-fashioned and sometimes even obscure appearances a certain humorous effect can be achieved. Since 1995 Samira Alikhanzadeh exhibits extensively in North America, Europe and the Middle East. Just recently, her artwork was on display in the Iranian Pavilion at the 56th Venice biennale. To simply classify Ashkan Sanei‘s (*1985, Urumieh) paper works as drawings would not meet their wide range. Examining his art pieces closer, clear work marks can be spotted, which structure the surface remarkably. For example, Ashkan Sanei uses sandpaper in order to give life to the material. Additionally, he even tears the paper apart or puts holes in it. In doing so his pieces gain a quite haptic appearance and the actual working progress moves to the focus. In 2011 the artist gained a MA in painting from the Isfahan University of Art. Since 2004 his works can be seen regularly in different exhibitions. In his photo series “Khoramshahr Number by Number” Babak Kazemi (*1983, Ahvaz) deals with the war-torn city Khoramshahr. Over two years he collected impressions of the effects of the Iraq-Iran-war and finally combined these with portraits of local individuals. Quite obviously a clear reference to the consequences of a war can be figured out, such as the forced displacement of humans. Babak Kazemi started his artistic career as autodidact in 1996. Since then he collected various prizes and awards and exhibits in solo and group shows. During the Venice Biennale 2015 an installation by him was exhibited at the Iranian Pavilion. The Mine is pleased to present The Impact of Tangency, a two-person show by Iranian artists Nastaran Safaei and Farnaz Rabieijah. A tangent is like a glancing blow. Perhaps you barely feel it. Perhaps the actual point of contact is so small so as to be nearly imperceptible, but it still leaves its mark all the same. A bruise spreading across a cheekbone; ink blooming across paper. We talk about tangents—that point when an object, any object, touches a curve—as distractions, as a kind of veering off course. At the same time, there’s a certain honest immediacy in following a tangent, and perhaps a certain vulnerability too. Safaei and Rabieijah are best known for their large installations that translate contemporary gendered and societal concerns, often at a monumental scale. Here, the artists translate themselves. The longtime friends found themselves standing at similar junctures in their lives, as artists and as women both. In these new bodies of work, they trade in their usual medium of sculpture, which involves extended tactile contact and a very manual engagement with the materiality of the object, for a series of experimental approaches to print. What emerges, unfurling luxuriously onto paper like a long-dormant shoot, is a feminized interiority and a sense of connection, both to nature and to the outside world. In her Body Impressions series, Safaei uses her own body to make marks on textiles. Unlike the full-body prints of Jasper Johns or David Hammons, however, the body is not depicted but only intimated here, with smears and swooshes that might be a shoulder or perhaps a knee; it is unclear. Spidery skeins of dots connect body parts to each other, sometimes trailing off over the page with a tentativeness that directly contrasts with the assertive intensity of these body prints. In Rabieijah’s Spinning Plate series, meanwhile, plants are pressed into paper to leave beautiful deboss-like indentations. Unlike pressed and preserved plants, the botanic matter is then remove and discarded, leaving only the void behind, like a trail of perfume after someone has forever walked away. شاید انگیزه اصلی این نمایشگاه زمانی در من ایجاد شد که در آستانه سی سالگی بودم. سی سالگی برایم بلوغ ذهن، دگر شدگی، از مرحله ای به مرحله دیگر رفتن و برایم تداعی داستان سیمرغ عطار را می کند. پرندگانی که تصمیم به یافتن سیمرغ که در قله کوه قاف زندگی می کند میگیرند. پس از طی طریق و تحمل مرارت، تنها سی مرغ توفیق رسیدن به قله کوه را می يابند، و آنجا عکس خود را در آب می بینند ودر می یابند سیمرغ خود آنها هستند. با خود می اندیشم این پرنده ها بعد از رسیدن به هدفشان باید هدف دیگری داشته باشند و به سمت قاف دیگری پرواز کنند. اگر ساکن بمانند٬ تحلیل می روند و خورده می شوند. کلمه مرغ پیشترها به طور خاص به مفهوم پرنده نر یا ماده بود. اما امروزه بیشتر شاید تداعی مرغهای بسته بندی شده در فروشگاه های مواد غذایی را میکند. پرنده ای بی بال و پر و بدون سر که توانایی پرواز و رسیدن به هدفی را ندارد. میز شام سیمرغ٬ سی مرغ ایستاده در بشقابهای برنزی٬ بزک شده و رنگارنگ٬ همانند مدلهایی در سالن مد هستند که تزئینات خود را به نمایش گذاشته اند. تحت تاثیر کلمه ی سـیـمرغ بودم که یک روز مـرغی درسـته را برای پخت غـذا خـریـداری کردم. مشغول پاک کردن و خرد کردن آن بودم که خود را بی تفاوت و ظالمانه در حال سلاخی کردن دیدم. در حالی که به دنبال دلیل این حس بودم تصویر خودم را در لباس سفید عروس در مراسمی آیینی دیدم که در آن نمایشِ قربانی کردن سی مرغ٬ برای تغییر و گذر به مرحله ای جدید از زندگی ام (سی سالگی) در آن اجرا می شد. Perhaps the main motive for holding this exhibition was developed in me when I was on the verge of turning thirty. To me, turning thirty means mental maturity, alteration, stepping from one stage into another and eventually reminds me of the story of “Simurgh”, inspired by a mythical Iranian bird of the same name, meaning thirty birds. In the original story written by “Attar” (a renowned classical Iranian poet), a number of birds decide to fly to the highest point in the universe (Ghaaf Mountain), in search of a supposedly sovereign bird called “Simurgh” (in Persian Si means thirty and murgh means chicken/bird). After a lot of pain and endeavor, only thirty of the birds survive the passage, who then see their own reflection in the water and realize that Simurgh, is in fact themselves all together as a team. The idea behind this installation was that achieving goals should not mean reaching the final point of the path, as goals are in fact the checkpoints. After arriving at each checkpoint, you should set yet another goal, fly again and reach the summit of other mountains. If birds stay still, they will eventually decay and dwindle. In the past, the word “Murgh” could refer to birds of any kind, regardless of gender, but in the present time, it is associated with a pre-packed chicken, sliced or as a whole, available in supermarkets and ready to be consumed. A decorated bird with its feathers plucked, headless, aimless and incapable of flying. Simurgh dining table, thirty birds standing in bronze plates, colorful and embellished, looks like a runway of models, showing off their ornaments and bijouterie. I was still under the impression of the word Simurgh, when one day I bought a whole chicken to cook. I was cutting the chicken into pieces when suddenly found myself slaughtering a creature so cruelly and so indifferently. While looking for the reason why I felt like this, I imagined myself wearing a white wedding dress in a ritual ceremony sacrificing thirty birds as a symbol and allegory of transition and change into a new stage of my life; turning “Thirty”. Nastaran Safaei was born in 1984 in Tehran/Iran. Beginning her journey as a sculptor by experimenting with pottery and clay in 2000 she was mostly self taught in her experience until attending Parviz Tanavoli’s first series of sculpting workshops in 2006 focusing on the Bronze technique which resulted in her first solo sculpture exhibition at Assar art gallery. The successful show made her a member of the association of Iranian sculptors. The main inspiration for her work is inner explorations of femininity by using mundane objects to express her experiences. She is deeply inspired by the mythological archetypes of Jung and the psychological methods of self-realization and ancient Iranian myths. Social and cultural issues influence her work deeply. She is currently working on the concept of time and the sub-conscious, focusing on the therapeutic aspect of her work in regards to her own psychological healing in relation to herself and the exterior. She regularly uses the human form to convey her ideas. Other than the Bronze technique, use of other materials in her works, which include Aluminum, Brass, Fiberglass, Papier-Mache and mixed media were all based on personal experimentation and experience. "There Are Too Many Walls But Not Enough Bridges"
Young Iranian artist Nastaran Safaei (born 1984, Tehran, Iran), one of the emerging talents of the Iranian contemporary art, has gained her success through exceptional sculptures and installations. In her work, the artist mainly focuses on social issues with a touch of personal experiences and an ironic view of such situations. In the exhibition \"Inner Selfie\", a title that can also be loosely translated as \"Inner Self Image\", the artist shows various aspects of her personal \"being\" as a woman, as well as her emotions. In her art, Safaei expresses the schizophrenia, which she is everyday at the mercy of: a flying chest, a bust of her head with octopus legs, her fingers and lips served as \"finger food\" or the installation \"Simurgh\", in which 30 decorated chickens were presented or served on golden plates. Nastaran Safaei studied for an Associate Degree in Graphic Design from Sooreh University (2004) and she received a diploma in Graphic Design from Naghshe Kowsar Art School (2001). Afterwards she focused mainly on media sculpture and installation. Today she is a member of \"The Association of Iranian Sculptures”. Since 2002 her works have been exhibited in numerous solo and group exhibition in Iran and abroad. 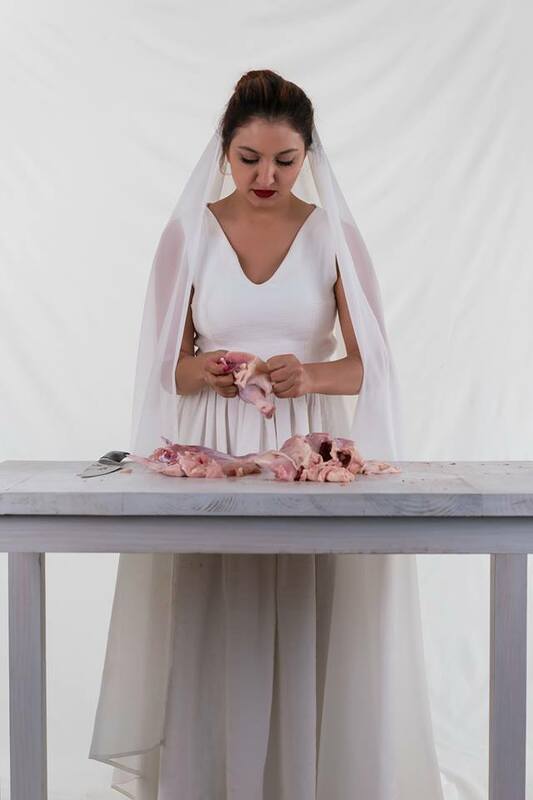 From October until November 2014 young sculptor Nastaran Safaei will be guest as Artist in Residence in our studio. The artist is already known over her country\'s borders. Her exceptional sculptures and subtle installations are strongly associated with her personality and her emotions. Not rarely addressed the young artist in their works her position as a woman in Iran with some satirical \"wink\". Her works are often ambiguous and can be read not only as a reflection of Iranian society, but also as a confrontation with Western culture. Nastaran Safaei studied for an Associate Degree in Graphic Design from Sooreh University (2004) and she received a diploma in Graphic Design from Naghshe Kowsar Art School (2001). Afterwards she focussed mainly on the media sculpture and installation. Today she is a member of \"The Association of Iranian Sculptures as well as co-founder of the sculpture circle \"Maakous\". Since 2002 her works has been exhibited in numerous solo - and group exhibition in Iran and abroad. 2013 her works has been shown in an extended solo exhibition at Etemad Gallery, Tehran and at the same time in a group exhibition entitled \"Excuses\": a group effort\" in the Villa Kuriosum in Berlin, Germany. During her residency Nastaran Safaei will create new sculptures and installation which will be displayed in her solo exhibition\"Inner Selfie\" on November 23, 2014. 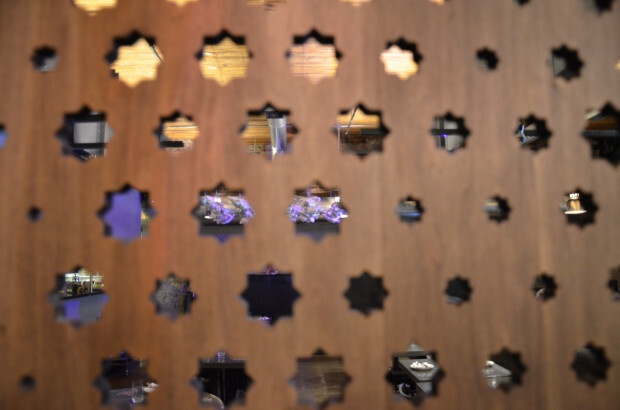 Simurgh, an art installation by Nastaran Safaei, hovers above the dining room at the Capitol Hill restaurant Mamnoon. 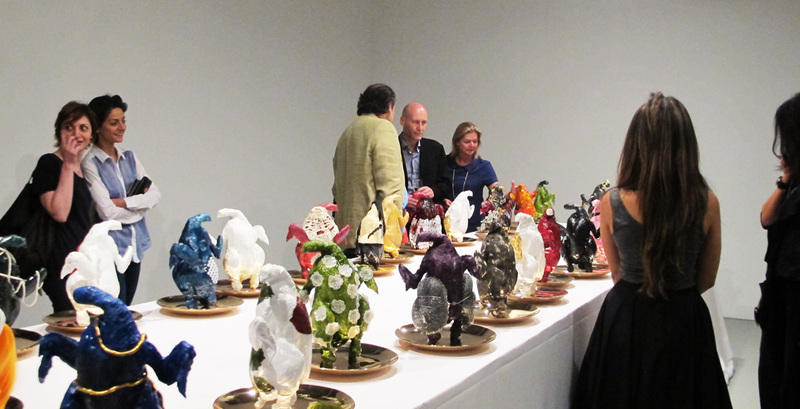 The newest installation, 30 chickens suspended in flight, is the work of a young Iranian artist, Nastaran Safaei. Its title, Simurgh, is both a play on the Farsi words for 30 birds and the name of a mythical, all-powerful bird that figures in a famous Persian poem. As summarized in notes from an exhibition at the Etemad Gallery in Dubai, the story goes like this: “A flock of birds undertake a difficult journey to the highest mountain in the Universe in search of the great Simurgh. Only 30 birds survive the journey, and upon reaching their destination, they realize that the Simurgh they seek is within them.” Food for thought to sustain the soul, even as you nourish the body. Iranian artist Nastaran Safaei’s latest exhibition, “Simurgh”, is inspired by the well-known Iranian legend of a powerful, immortal mythical bird called Simurgh. But the name of the bird is also a play on the Farsi words for the number 30 (“si”) and birds (“murgh”). The story goes like this: A flock of birds undertake a difficult journey to the highest mountain in the Universe in search of the great Simurgh. Only 30 birds survive the journey, and upon reaching their destination, they realise that the Simurgh they seek is within them. Safaei’s installations, “Simurgh I” and “Simurgh II”, reflect the philosophy behind this story. 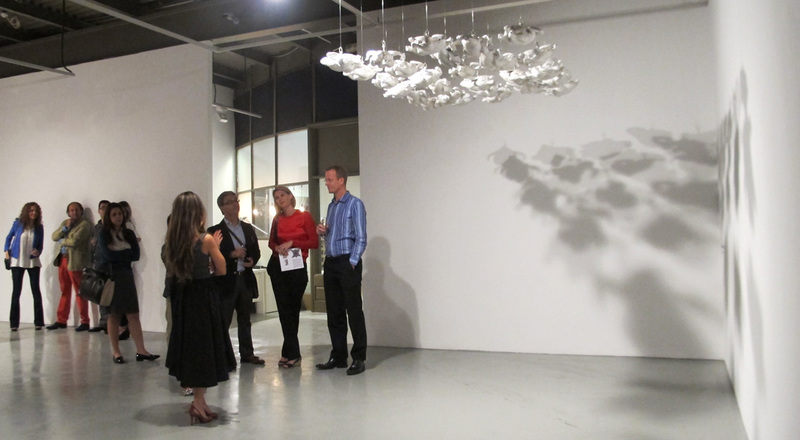 The first work features 30 sculptures of birds in flight, suspended from the ceiling. The second one is a dinner table with thirty brass dishes and a bird standing in each dish. The birds are headless, their feathers have been plucked, but they are painted with bright colours and decorated with jewellery and other trinkets. “The birds in the story had the qualities of the mythical Simurgh because they had the passion to search for a greater purpose in life. The white, almost invisible birds in my installation represent these seekers. But I want to ask whether the birds will continue to be Simurgh if after reaching their ideal high point they stop progressing, developing and setting new and higher goals. The birds in the second installation represent materialistic, superficial and selfish goals, which transform a Simurgh into a soulless, headless chicken on a dinner plate,” the artist says. 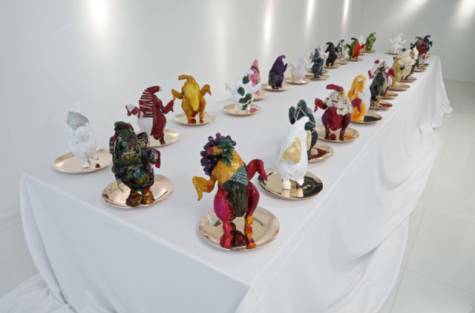 “Simurgh” will run at Etemad Gallery until April 22. Etemad Gallery Dubai invites you to the private view of new sculptural works by Nastaran Safaei which coincides with Art Week at Art Dubai, 2014 and is her first solo exhibition in the UAE. Natsaran Safaei’s practice centres on femininity and womanhood, interplaying between objects that embody these notions, or what society ascribes as ‘the feminine’. Objects such as kitchenware, high heels, handbags, cosmetics are superimposed with body parts and ephemera such hair, lips, eyes, feet are incorporated in her largely sculpture based practice. 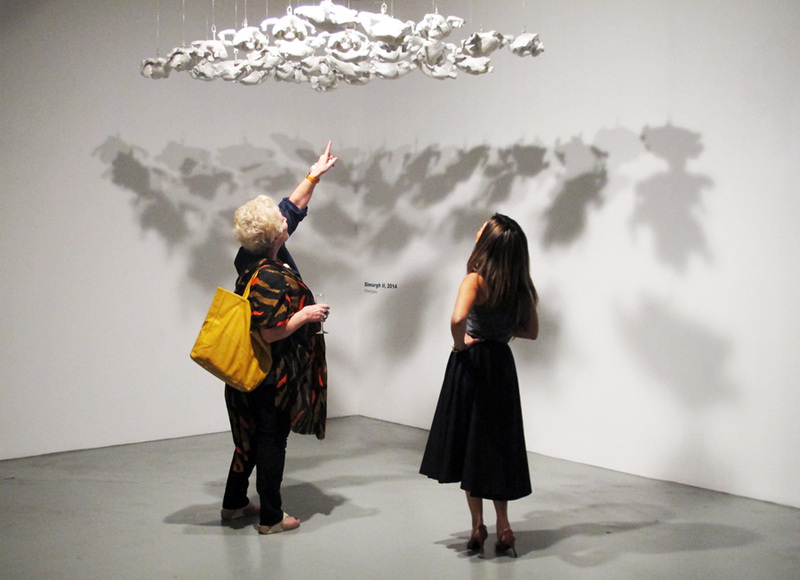 For her Dubai solo, she takes a denature from her usual feminist concerns and presents an installation Simurgh (2014), based on Conference of the Birds by Farid al-Din Attar titled. 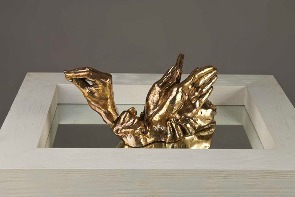 Simurgh is an installation inspired by the famed mythical Iranian bird of the same name. This installation plays on the word Simurgh, which can also be read as a blend of two Farsi words, \'si\' and \'murgh\', meaning thirty birds. 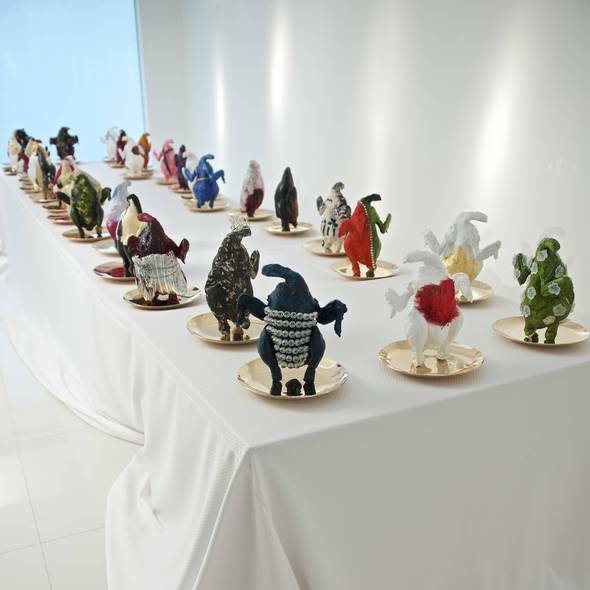 The installation consists of a dinner table with thirty dishes with a bird on each dish, each bird representing a year of her life for her thirtieth birthday. Born in Tehran, Iran where she presently lives and works, Nastaran Safaei studied for an Associate Degree in Graphic Design from Sooreh University, Iran in 2004 and in 2001 received a Diploma in Graphic Design from Naghshe Kowsar Art School, Iran. She is a member of The Association of Iranian sculptures and has exhibited extensively in Iran as well as participated in Slick Art Fair Paris and Christies Middle Eastern Auction, Dubai in 2010 and 2011 respectively. 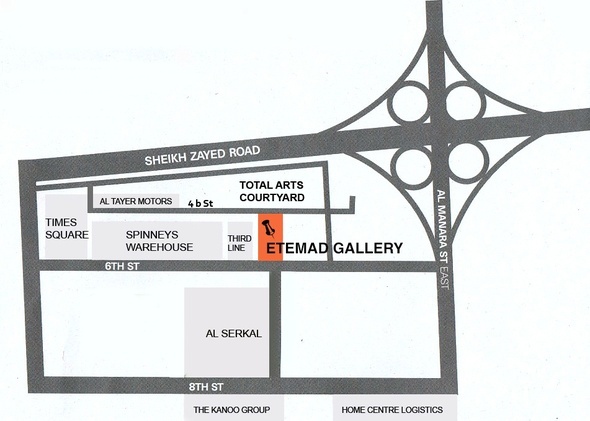 For more information about the exhibition artists and image requests please contact info@etemadgallery.com or call Ariane Nouchi on + 971 5614 98958.